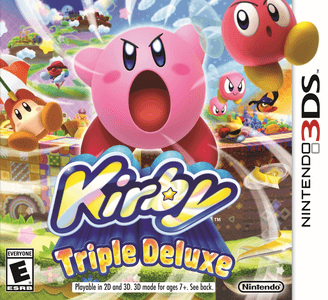 Kirby: Triple Deluxe works near flawlessly in Citra. Graphically, the game is considered near perfect with minor graphical issues (e.g. Royal Road 6 - Stage 1 Hal Room background) and performs well even on lower-end hardware. It still suffers from minor audio issues (e.g. some sound effects like Kirby inhaling or abilities full charge sounds effects sounds a bit strange), but this does not hinder the gameplay in any way. Endless Explosions - Stage 3 Only File 1 at 47% of completion, starts in Level 6 "Endless Explosions" at Stage 3, Dedede Drum Dash completed.